As I write this, hundreds, if not thousands, of U.S. citizens are voicing their displeasure about conditions—mostly economic—by “occupying” Wall Street and other iconic sites. This action appears to be a manifestation of a growing frustration with how things have changed since the economic meltdown of 2008. I’m expecting that the anger toward Wall Street will soon spread—to banks, businesses, the paperboy, and the Edward Jones rep. But who’s really responsible for our misery? We are. 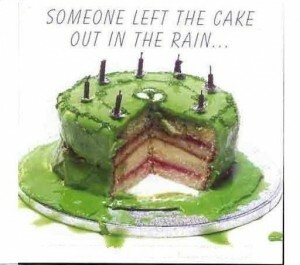 “Someone left the cake out in the rain” is a line from the song “MacArthur Park.” Jimmy Webb wrote the lyrics as he suffered the pain of a breakup with Susan Ronstadt, Linda’s cousin. For me, it’s taken 40 years to encounter a situation that explains those lyrics. In 2007, unemployment was 5%, the market was yielding 10% annually like clockwork, and housing was growing at 7% per year. We all acted like wide-eyed kids in a bakery, each wanting a bigger piece of that ever-growing cake. And then someone left the cake out in the rain and it was all over. But do we really expect a magic pill? A switch our leaders can pull that will take us back to 2007? The “Occupy” protesters are eerily reminiscent of the hippies of the ’60s who occupied MacArthur Park in L.A., Central Park in Manhattan, Haight-Ashbury in San Francisco, and any other public place to exhibit their frustration. “I don’t think that I can take it,” is another line from the song. The Occupiers are saying the same thing. Jimmy lost Susan and wrote a song about losing something wonderful. We’ve lost our loves, too. Good roads and safe bridges. Innocent honesty. Five percent unemployment, 15% investment returns, a 15,000 Dow Jones Industrial Average, and $1.09 gasoline. But instead of blaming everyone else and insisting that we get these things back, we can take a different approach. It’s time to move on. Let’s get into our Learner/Researchers and manage our expectations. Let’s explore the data, let go of the past, and figure out where we go from here. I so completely agree with this. Not just in terms of our lives vis a vie government but also as individuals. Thanks! Tricia, “stuff” happens. Sometimes it’s just plain accidental, and sometimes others make it happen. Either way, getting clear about the change we’re faced with rather than bemoaning the loss of our past comfort seems more productive. Thanks for the comment!